One afternoon in July 1977, David Bowie was looking out of the window of Hansa Studio in Berlin when he noticed a couple kissing near the Berlin Wall. The basic track had already been started by Bowie and Brian Eno in the weeks before, with Visconti behind the mixing desk. Their working method during Bowie’s so-called ‘Berlin period’ was to build layered tracks that would later inspire lyric and melody, like making the frame before the picture. And using Eno’s ‘oblique strategies’ cards (aphorisms that encouraged lateral thinking), they would often give themselves creative dilemmas within that frame. From the start, Eno described the music as “grand and heroic”, and said he had “that very word, ‘heroes’, in mind.” After the basic track was done, he overdubbed shuddering atmospherics by twiddling knobs on his EMS Synthi, a mini-synthesizer built into a briefcase. The final touch was added by guitarist Robert Fripp. What the King Crimson leader later called “hairy rock’n’roll” was more a soaring series of aria-like feedback loops. Fripp marked with adhesive tape the spots on the studio floor where he could lock into certain singing tones. For a guitarist known for playing while seated, it’s interesting that one of his most enduring performances came from stepping and swaying. The finished track sat for weeks. There have been rumours that Heroes was intended as an instrumental (hence Fripp’s wall-to-wall soloing). But Bowie says he was just waiting for the right lyrical spark, which eventually came from the lovers by the Wall. Heroes was released as a single in September 1977. It only reached No.24 in the UK, and didn’t chart at all in the US. 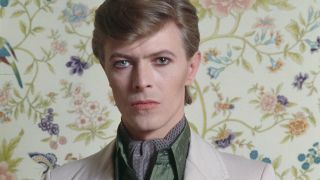 But the emotional power of the song would continue to resonate, as it became one of Bowie’s theme songs, along with the likes of Space Oddity and Changes. Its most memorable moment would come 10 years later, when he performed it live at the Platz der Republik Festival, right across from the studio in Berlin where it was conceived. “I’ll never forget that,” he recalled. “It was one of the most emotional performances I’ve ever done. I was in tears. They’d backed up the stage to the Wall itself so that it was acting as our backdrop. We kind of heard that a few of the East Berliners might actually get the chance to hear the thing, but we didn’t realise in what numbers they would. And there were thousands on the other side that had come close to the wall. So it was like a double concert, where the Wall was the division. And we would hear them cheering and singing along from the other side. God, even now I get choked up. It was breaking my heart. I’d never done anything like that in my life. And I guess I never will again. “When we did Heroes it really felt anthemic, almost like a prayer,” Bowie continued. “I’ve never felt it like that again. However well we did it later, it was almost like walking through it compared to that night because it meant so much more. That’s the town where it was written, and that’s the particular situation that it was written about. It was just extraordinary.